It might look like magic when Santa appears at the conclusion of Thursday’s three-hour annual Macy’s Thanksgiving Day Parade, but Macy’s staff has been planning the event for 18 months. Here’s a full breakdown of the parade, by the numbers. 3.5 million spectators: The number of people lining the cold streets of New York to watch the parade is expected to exceed the population of Panama. Thursday’s high temperature is forecast to be 33 degrees, NBC New York reported. 51 years: The parade has been broadcast by NBC for the past 51 years. “Today’s” Matt Lauer, Al Roker and Savannah Guthrie will anchor this year’s broadcast from 9 a.m. to noon across each time zone. 50 million viewers: The parade telecast last year drew the most television viewers since 2001, when the parade honored the victims of the Sept. 11 attacks, according to the New York Times. This year, organizers expect more viewers in the U.S. to tune in than the entire population of Colombia. 52 balloons: New and revamped balloons include Adventure Time with Finn and Jake, Snoopy with his pal Woodstock, SpongeBob SquarePants and Toothless the dragon from “How to Train Your Dragon.” The enormous Ronald McDonald and giant Buzz Lightyear are among the balloons returning this year. 1 dreidel: To celebrate the first time that Thanksgiving falls on the first night of Hanukkah, a dreidel will spin down the parade route. 900 clowns: These aren’t just any clowns. Macy’s parade clowns are specially trained. Under the Big Apple Circus big top, all the volunteers attend Macy’s Clown U, where they learn everything from entry-level confetti creations to clown car driving 101. Clowns are one of the only parts of the parade that have appeared every year since the parade began. 8,000 participants: The clowns, bands, dance teams, and celebrities add up. Among those set to participate this year: The Robertson family from Duck Dynasty, Kristin Chenoweth, Gavin DeGraw, Fall Out Boy, Jimmy Fallon, The Roots, Fifth Harmony, Florida Georgia Line, Richard Simmons, The Radio City Rockettes, Ariana Grande, and Austin Mahone. 30 floats: The famed little, yellow “Minions” from “Despicable Me 2” will whip up a mix of goodies and mayhem on a new 33-foot-long bakeshop float. A master chocolatier will have some more gooey treats and the Goo Goo Dolls onboard Lindt‘s new float. A new flying ship with custom-trampolines will be the playground for 20 Cirque du Soleil acrobats. Spectators will take a dive underwater in Seaworld’s float featuring Shamu, turtles, penguins and tropical fish. All the fancy, elaborate floats are made of foam, wood, metal and paint. 2 controversies: Animal rights organization PETA is angered over Seaworld’s float, after the documentary “Blackfish” tarnished the theme park’s reputation. The documentary accuses the park of mistreating killer whales and PETA has asked Macy’s to remove the float. 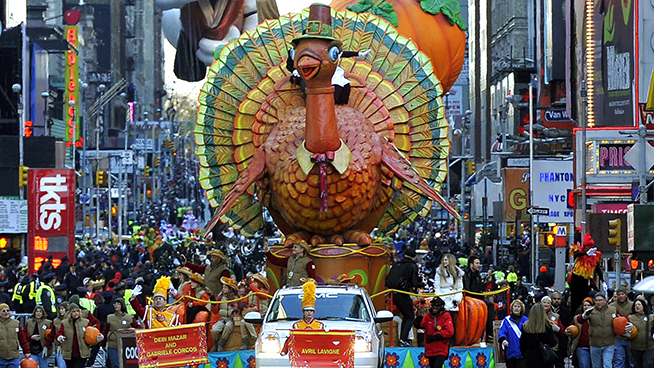 Since Macy’s has refused, the group plans to protest the parade. “We [at Macy’s] honor and respect the rights of all Americans to express their views peacefully and anyone wishing to exercise this right along the route must do so within the bounds of the law,” Veras said. The other controversy includes a PETA advocate—rocker and vegetarian Joan Jett. She was scheduled to perform on South Dakota’s tourism float, which angered some ranchers since cattle are important to the state’s economy. Jett will now be performing on another float. “Macy's intention is only to provide a range of entertaining elements without judgment, endorsement or agenda,” Veras said. $??? : The price of the parade is a mystery. “Macy's views the Parade as a gift to the City of New York and the nation, and like any good gift, you cut off the price tag when you give it, so we keep to that tradition as well,” Veras said.